Bota-sa was our next stop during Buddha’s birthday celebrations. Welcome to Week 279 (5/26/2016) of Travel Photo Thursday. This is going to be a quick post. I am really under a lot of time constraints right now with the end of the semester looming. Do enjoy a bit more of Buddhas birthday this week. After enjoying the festivities at Bomun-sa and Mit’a-sa, we made our back to the bus and managed to creep through the traffic to our next destination, Bota-Sa hermitage. The temple serves as a convent for approximately 50 nuns studying Buddhism and social work. Bota-Sa was relatively quiet. 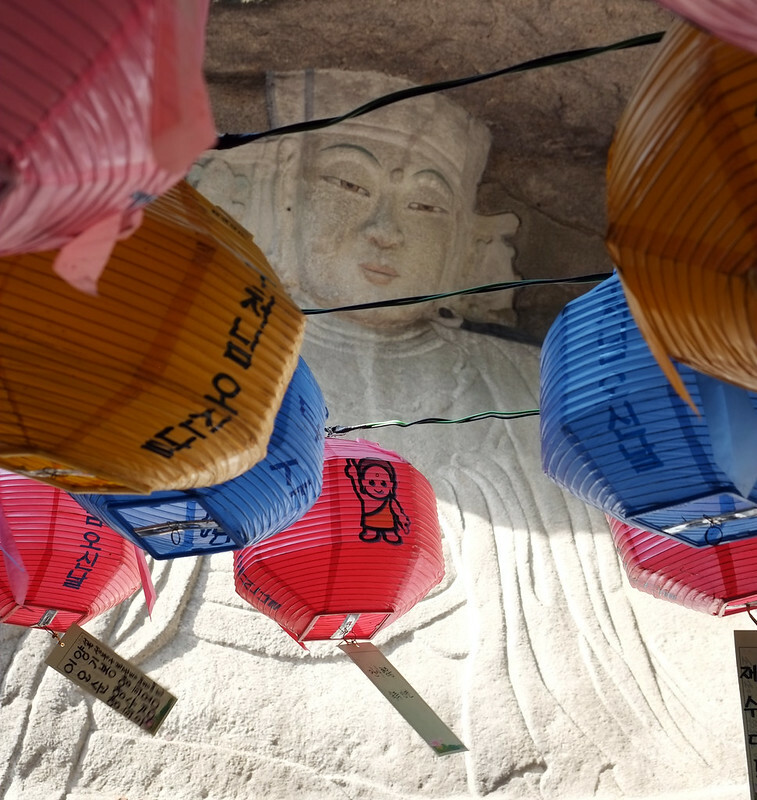 This order of nuns is connected to a temple near the city of Daegu, so most of them traveled there for Buddha’s birthday. The temple is known for its fifteen foot white Kwanseum Posal (or Goddess of Mercy), carved on the rock behind the main temple building. We passed these grave markers on the way up to Bota-sa. 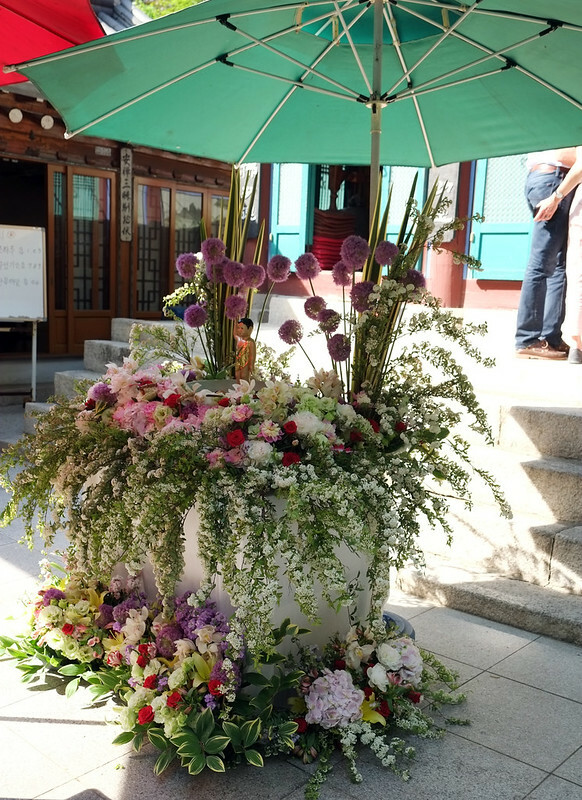 Beautiful floral arrangement in front of the main temple building. 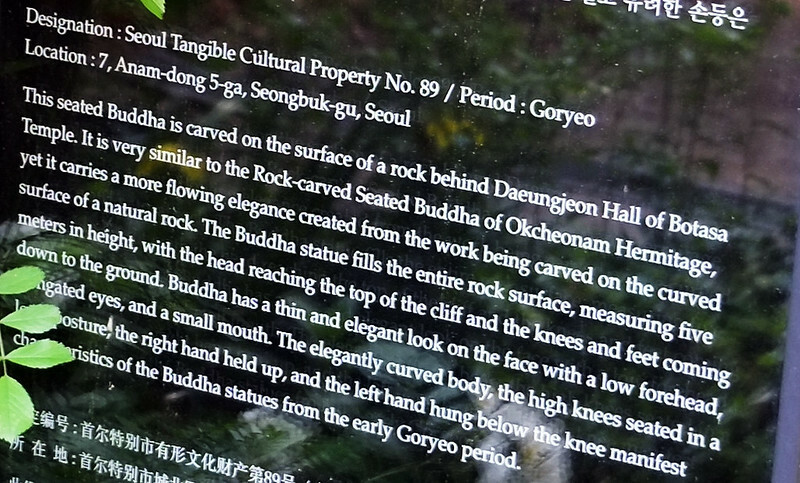 A description of the famed stone Buddha. Hard to get a shot that shows the complete statue. I needed a different lens! However, I think the head is the most interesting aspect. I don’t remember seeing a Buddha look like this anywhere else in Asia. 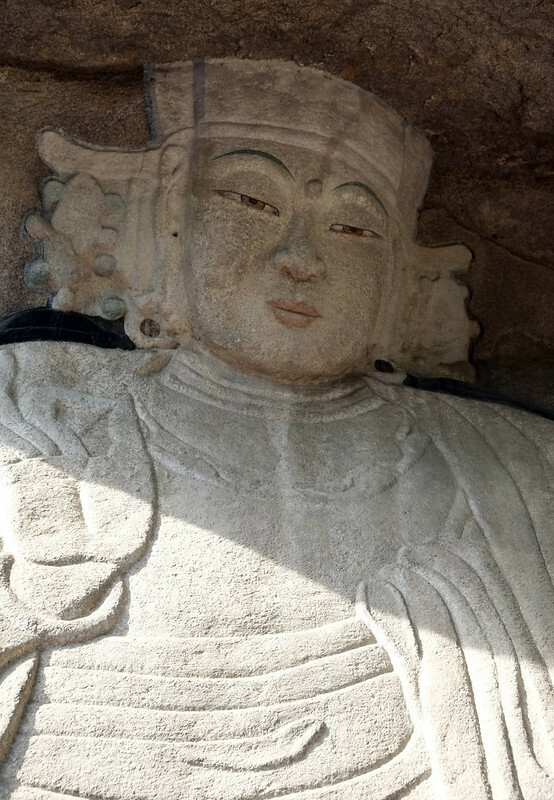 Apparently, this is how Buddha was visually represented during the Goryeo Period in Korea. Candles at the base of the statue lit in celebration of Buddha’s birthday. 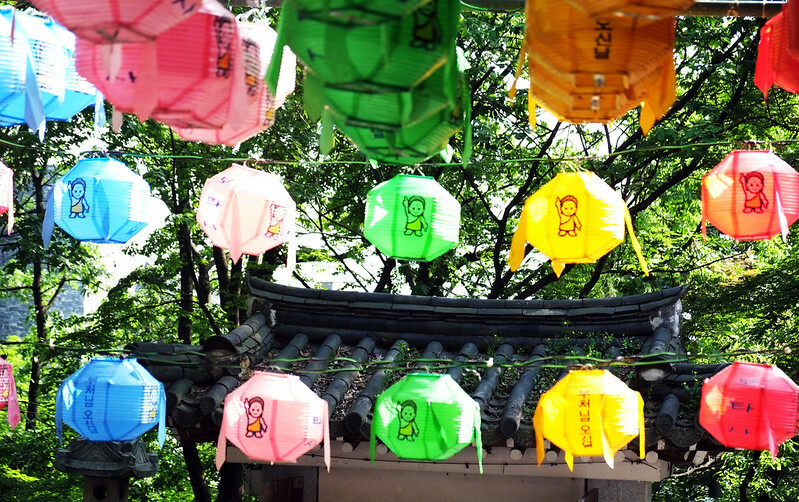 Buddha’s birthday decorations are not complete without colorful lanterns. Bota-sa is just down the street from where I work. To get there take subway line 6 and get off at Anam Station. Check out the map here. Like most temples, it’s usually opened daily from sunrise to sunset. 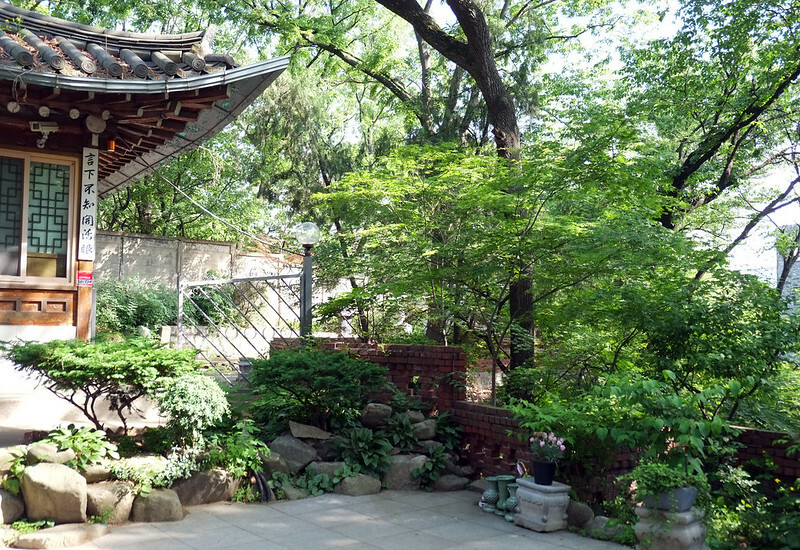 While you’re in the neighborhood, visit the beautiful buildings on the Korea University campus. The features of Buddha’s idol are so beautiful and radiates so much of peace. Very well captured. Great knowing about this place. Hi Indrani. Thank you! I agree, definitely a feeling of peace radiates from this statue. I just wrote a comment and it said it wasn’t enough but the link back then didn’t work??? I hope this is enough…?? Hi Lydia. Sorry your having problems commenting! Thanks for linking up this week. Buddha does look slightly feminine there, doesn’t he… but then I suppose the Buddha transcends mere gender stereotypes. Hi Sophie. That is so true, and I think it is always interesting how each country depicts Buddha and how that image can change with time. We were surprised to see in Thailand and Laos a mixture of feminine, masculine and androgynous buddhas. Most of them were pretty skinny too – a far remove from the big jolly fat Buddha we grew up knowing. That is a beautiful floral arrangement Nancie and I like the pure white candles at the base of the statue. 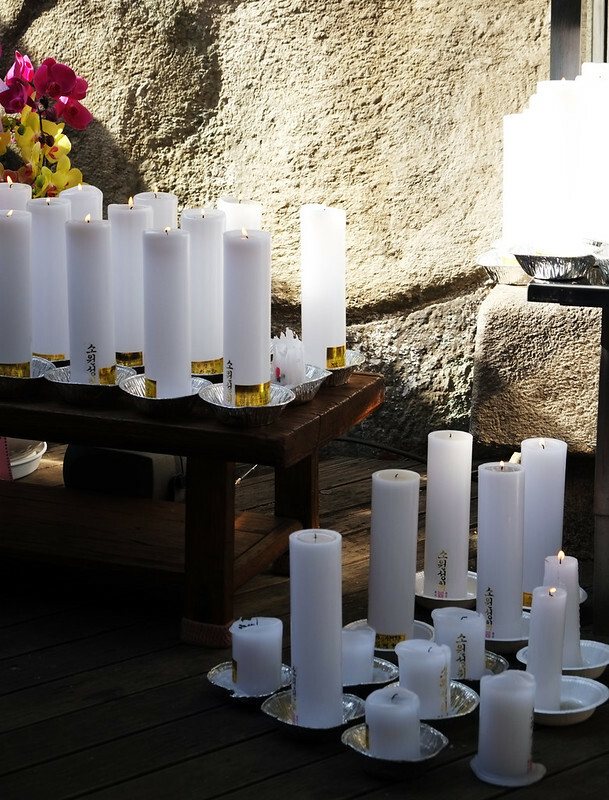 The candles I’ve seen in temples in Cambodia and Vietnam were a creamy colour. Maybe this pure white ones were special for Buddha’s birthday. I would think this Buddha would seem to be looking at you wherever you stood. I hope the end of semester doesn’t prove to be too stressful. Perhaps just sit for a while like Buddha. Hi Jackie! I know! Hard to believe that summer is almost here…YAY. What happened to your name? You went into my spam. thought maybe your site got hijacked. Love the photos Nancie. The Buddha’s expression really is thought provoking. Hope you have a bit of time off soon! And, if I remember right, Nova Scotia should be in your plans soon. 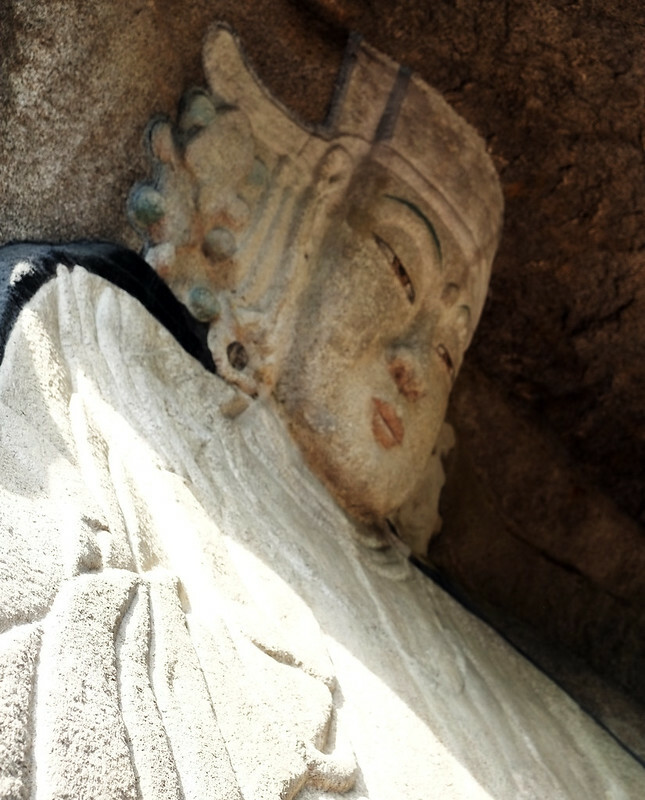 This Buddha’s features look so lifelike, especially the eyes. This Goddess of Mercy looks very different than the one that’s famous in Penang. The Bota-sa one seems so serene. 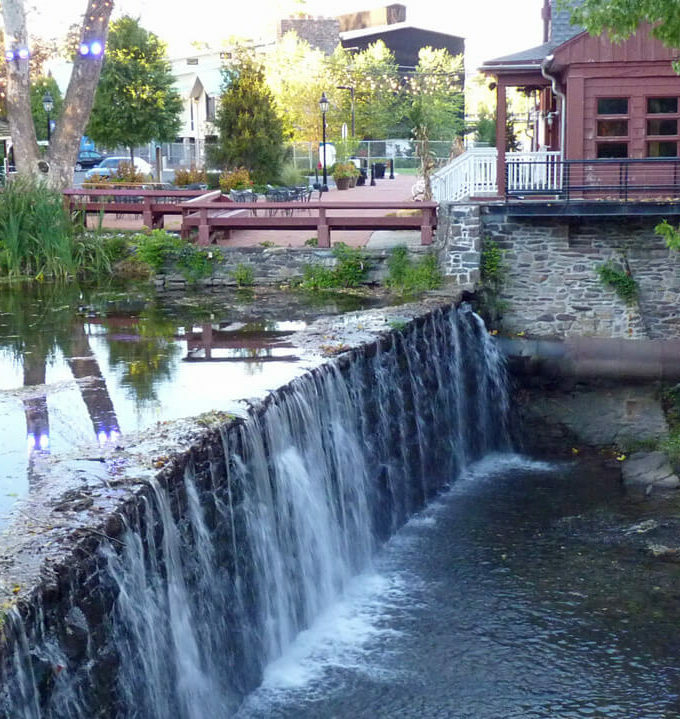 Do you go to this place often since it’s so nearby?